Ever since its inception in 1985, Thomas Kjellerup held on to his own personal style, without regard to current trends - and one must say that he has run exceptionally well from it! 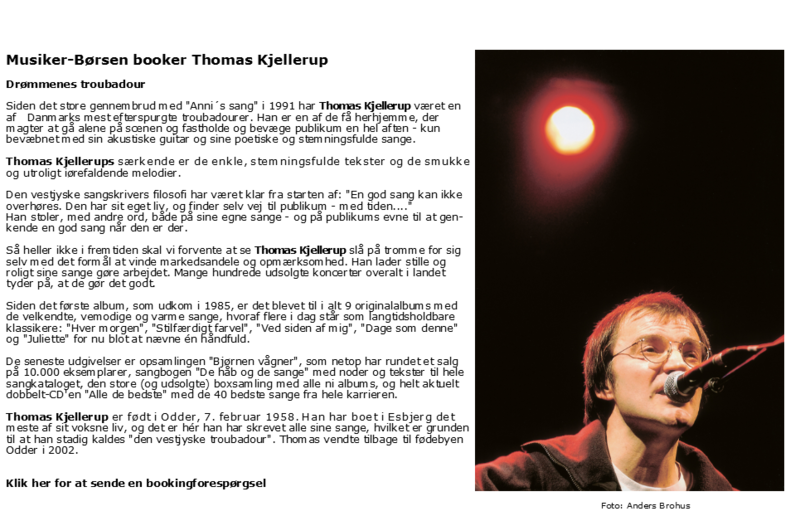 Today, Thomas Kjellerup known as one of the country's finest troubadours, with hundreds of sold-out concerts behind him. His hallmark is the simple, evocative lyrics and the incredibly catchy tunes. Since the first album, released in 1985, has grown to a total of 9 original albums with the familiar, sad and hot songs, several of which today stands as durable classics: "Every morning," "Quietly goodbye", "Next Me, "" Days like this "and" Juliette "for now to mention only one handful. Recent publications include the compilation album "The bear wakes" which contains 18 of the most requested songs, songbook "The hope and the songs" with musical notes and chords to the entire Thomas Kjellerups song catalog - not to mention the big box with all nine albums, which appeared in 2007 under the title "Complete Collection". He is the epitome of a troubadour. He is one of the few home who manage to walk alone on stage and maintain and move the audience a whole evening. Armed only with his acoustic guitar and, mind you, a string of evocative and timeless songs. Every musician's dream - so it must be when record stores even call and ask for a new CD. Thomas Kjellerup, show singer has also acted in haste, and in 2003 published "The bear wakes", which brings together 18 of his best songs from nearly 20 years of career. RUP Music called the record company - and if it brings to mind the last three letters in the singer's name, it is not entirely accidental. The plate is his own product throughout. This has been true throughout Thomas Kjellerups career. He grew up in Odder, but a job as an illustrator and led him first Varde, since Esbjerg. It was back in the early 1980s, and if some of the time had said show singer, he would have looked dumbstruck. But when Thomas Kjellerup relaxed, it came with a guitar and including John Denver songs - until his own compositions began to intrude. And the songs he put on a lp-plate, which actually got good reviews. After which people began to call: If he could not play there and there? In many ways it was - with Thomas Kjellerups own words - "a lock opened." The first songs were joined by new concert the number grew, and the contact with the audience turned into a very positive experience. So after the release of the second album in the fall of 1987 He boosted a date: From 1 January 1988 he would give the music a chance and spend all his time on his songs. - Then press called me show singer without myself were aware that that was what I was. But it was probably my luck, to show the singers were few, and all were supposed to hear what this one could. So the jobs continued to be followed by more plates. And by "Annis Song," which in 1991 secured Thomas Kjellerup his first real hit. In 1995 the CD "Troubadour" that pushed extra on his career. And a first CD of the best songs, "For Anni and all the other" from 1997 sold no fewer than 30,000 copies. He had performed all the great places he had played with famous colleagues plates sold well - so what? Therefore, 2001 was a year off - and a pilgrim year. To show the singer asked the guitar down and bought instead a backpack, and then he walked along the old pilgrimage route from Le Puy in France to Santiago de Compostela in northwestern Spain. Two months and 1,500 miles on sore feet. Yet the trip an experience of walking along roads where others have moved in thousands of years, and where everything fades a religious tone, we do not know at home. - I've never felt so much as on the hike. I found a joy and a celebration of life that is hard to find in a Danish daily, he explains. It was the beginning of much thought and consideration, including about the future ballads. - But it was what I wanted, I agree with myself. I will keep my songs alive because I'm starting to see the matter to others. I can not just let that go. On the other hand broke Thomas Kjellerup up physically. He sold his house in Esbjerg, lived eight months on the island until new concerts made island - the life of a hassle, and now called home town so Odder - childhood town. - It is also a result of the pilgrimage - that I need to look both forward and back, he says. On the front plate marked Thomas Kjellerup again with the album "Fragile Heart", which came just before Christmas and is now followed by a tour. And in 2003 appeared as "The bear wakes up" because the old "best-of" CD was sold out and there was a need for a new view of the music. Both plates are published by himself - just like the 9 plates that lie ahead. He is best to be completely his own master - it ensures him the freedom to choose the music, and it ensures him also the full proceeds from the sale. Partly for that reason, he has also been able to live music since he first January 1988 took the plunge. And although his career has led to consideration of the way, the music is also a driving force in the future. Put the reassurance of the increasing number of Thomas Kjellerup can call his faithful audience. Thomas Kjellerup born 7 februar 1958.